I was recently invited to visit Miller & Carter, a steakhouse on the edge of the Red Dragon Centre leisure development in Cardiff. I’d actually been once before, but never got round to reviewing it, although I’d been fairly impressed, so was pleased to have an opportunity to go back and refresh my memory so I could blog about it! Miller & Carter is owned by Mitchells and Butlers, who dominate the UK’s chain dining market as they run a vast array of pub and restaurant chains in the UK, including Sizzling Pubs, Harvester, Toby Carvery, O’Neills and Browns. The Cardiff venue sits alongside Pizza Hut, Chiquitto’s and The Chicken House, so you could be forgiven for thinking, as I did, before I went, that it would be in a similar vein to these venues – very children-orientated, with cheap and cheerful, crowd-pleasing dishes. Anyone who reads my blog regularly will know that those are not my kind of restaurants, so I was really pleasantly surprised when I read a bit more about Miller & Carter prior to my first visit and discovered that, although they are a chain, they pride themselves on serving their own reared, 28-day aged West Country beef from sustainable farms. I was even more pleasantly surprised to see that they specify a dress code: smart casual is required, or dress to impress if you please. When I’d visited before, I went on a Monday night and it was very quiet, but this visit, on the evening of Good Friday, couldn’t have been more different – it was packed! We planned to have a drink in the bar as we’d arrived a bit early for our table, but we struggled to get to the bar, it was really that busy! We did eventually manage to get a drink and were also given a pager for when our table was available, which was bang on the time we’d booked for. 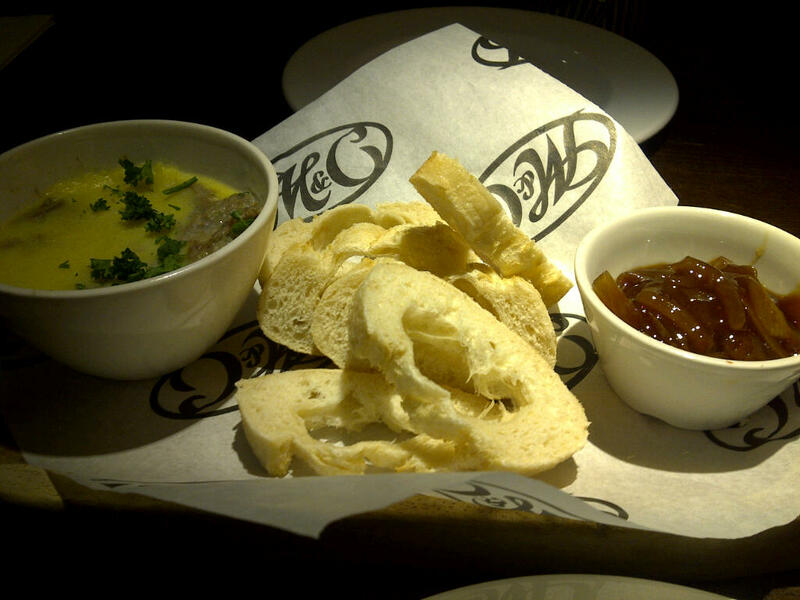 To start, we shared a dish of Duck Rillettes, which was very good – chunks of tasty duck topped with clarified butter and served with ciabatta-type bread and an onion relish. Unfortunately, the amount of bread served with the dish was nowhere near enough to go with the quantity of Rillettes (which, as a starter for one person, actually seemed excessive anyway). This wasn’t helped by the fact that the loaf our bread had been cut from obviously had a massive air bubble running through the middle of it! So, we asked for more bread, which did arrive, but still wasn’t exactly plentiful. The onion relish looked a little slimy, but tasted really good and worked well with the duck. As well as a huge range of steaks, Miller & Carter offer burgers, and other meat, poultry, fish and vegetarian dishes for those who don’t want to have a steak. The steaks, although not bargain basement prices, are incredibly good value as they come with several side orders, a sauce and an iceberg lettuce wedge, which comes with a choice of dressing and is served before the main course. I chose the bizarrely named ‘stilton and blue cheese’ dressing for mine – I was unsure what stilton was if not a blue cheese – but it transpired that it was blue cheese dressing with a crumble of stilton cheese on top. Mr W went for bacon and honey mustard, which, less confusingly, was honey mustard dressing and a topping of crumbled bacon (real bacon, not the horrific ‘bacon bits’ served in some restaurants!) 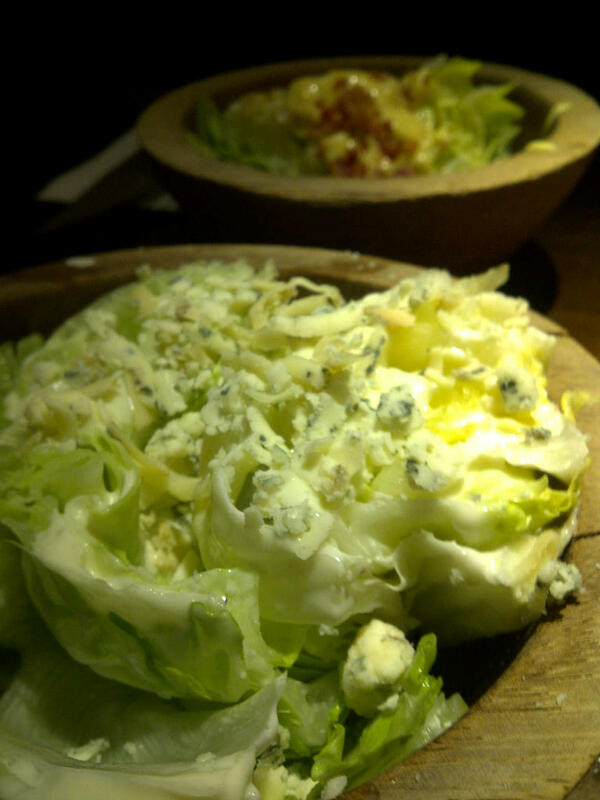 The iceberg wedge is a nice addition to the meal and, if you were on a budget or had a smaller appetite, would make you feel like you were still having a starter. 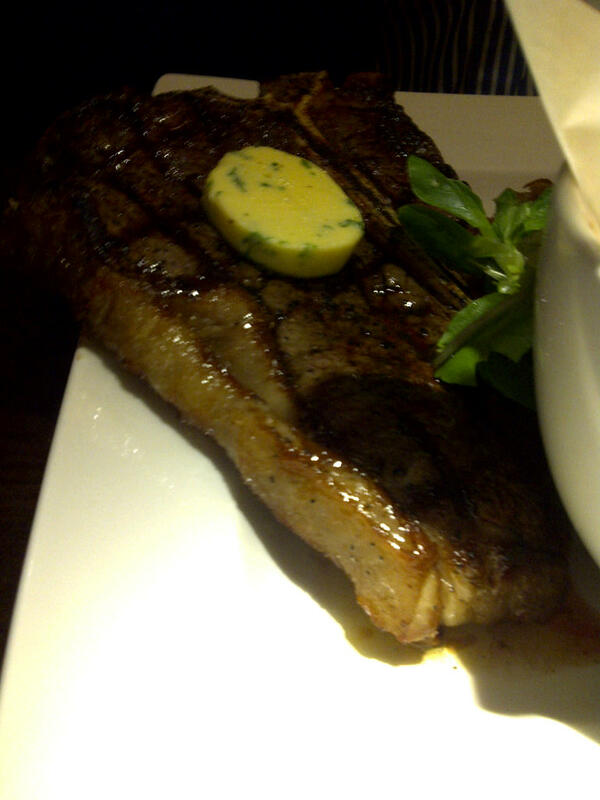 I chose an 8oz fillet steak, which was priced at £21.95, and Mr W chose a 14oz T-bone for the same price. The menu is certainly the most comprehensive selection of steaks I’ve seen in Cardiff, with chateaubriand, Porterhouse, the aforementioned T-bone and fillet Wellington all featuring alongside the more standard selections. Additions like rack of ribs or grilled lobster tail could be added at extra cost. Our steaks were both cooked excellently, medium rare as we’d requested, and were served with a pat of garlic butter on top, which I did find a little bit 1980s, but it was a nice touch – although our medium rare steaks were not hot enough to melt it. All the steaks came with seasoned fries, a slice of Miller & Carter’s signature onion loaf, grilled cherry tomatoes, a small salad garnish and a sauce of your choice. The fries were crispy and well-seasoned, and couldn’t be faulted for what they were, but personally I’d have preferred really thick cut chips with a steak. I’m guessing that the high volume and turnover of covers they must experience in the restaurant must make it difficult to serve this kind of chip to a high standard, however, so I assume that the thinner fries are a safer option – and they certainly did them well. The onion loaf is an interesting alternative to onion rings: batter onions shaped together and baked into a loaf, then sliced. It was very tasty, but a little bit greasy in places. Considering, as alluded to in my comment on the chips, the kitchen at Miller & Carter on busy days must be something of a production line (indeed, all the starters and puddings were dishes that could be made in advance – and why not? ), everything was cooked exceptionally well. The only let down was the sauces. My béarnaise had the right flavour, but the wrong texture (it was thin and runny), and Mr W’s peppercorn didn’t taste right, and was also too thin. These seemed very much as if they were produced en masse (perhaps not on the premises) and ladled into dishes from a large vat. At this point, I felt grateful for the garlic butter I had previously disparaged as being a bit retro! The only other slight disappointment was the wine. Although there was a cocktail list on our table, and cocktails seemed very popular with many of our fellow diners, we had to ask for a wine list. I was driving, so only had a small glass of Malbec, but Mr W had tried a Merlot in the bar and pronounced it to be bordering on unpleasant, so moved on to a Malbec with the meal – which was better, but not particularly good. Perhaps we chose badly, but with a good steak, it’s disappointing not to be able to have a really good glass of red. 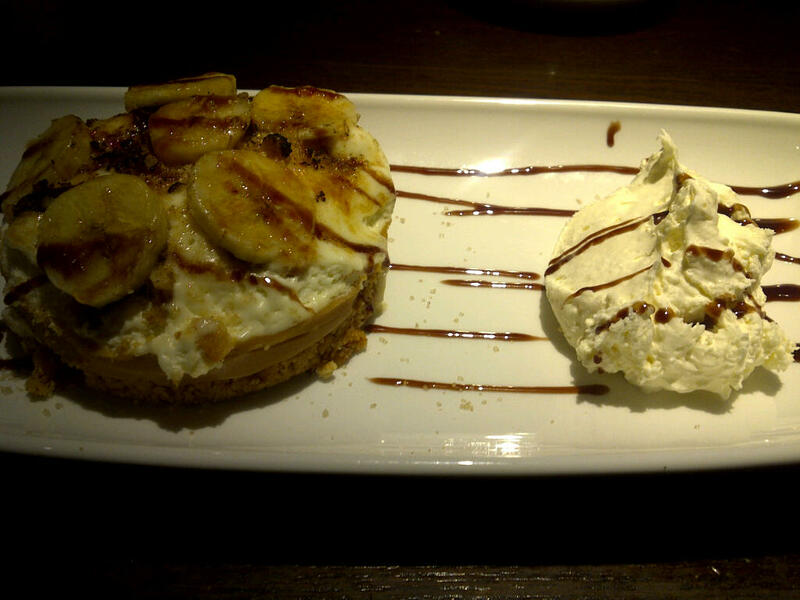 To finish, we shared a banoffee pie. I didn’t have high hopes for it, as mass produced desserts in chain restaurants are often a massive let down – but this was actually very tasty, and what we thought was going to be ‘squirty cream’ was actually some pretty good (if slightly surplus to requirement alongside the creamy pie) whipped cream. It was topped with fresh bananas, and the biscuit base was nice and crisp. The service we experienced was efficient, although our waiter spoke so fast when running us through the options for sauces, side dishes, how we wanted our steak cooked etc. (which could be complicated to a novice Miller & Carter diner!) that it was as if he couldn’t get away from us quick enough. I do think he meant well, however, as he seemed very friendly and eager to please. In terms of ambience, because of the restaurant’s location in a leisure complex, there is a tendency for it to feel a bit chain pub-like (I’m thinking Harvester!) but they have tried really hard to avoid this, and on a busy evening, when a number of fellow diners had actually followed the dress code and dressed to impress, it actually had quite a nice feel to it. The set up and layout actually reminded me a bit of a number of American chain restaurants (as opposed to fast-food outlets) I’ve been to, with booth-style tables cleverly separated from other diners whilst still maximising the space available. I can see why it could be a good special occasion choice if you have a large group, a range of ages, people with large appetites or a variety of tastes to please. 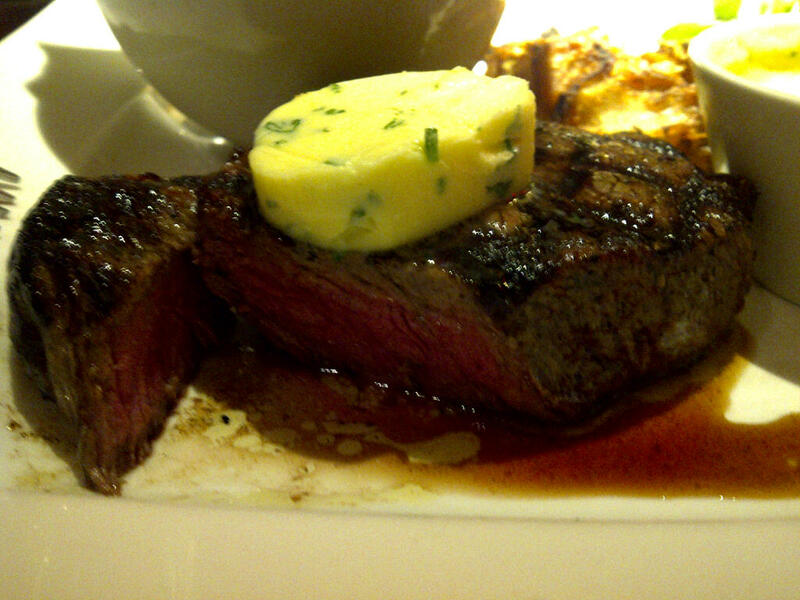 If you’re seeking fine dining and innovative cuisine, you’ll be disappointed, but if you want a good steak that is very good value compared with many other places in Cardiff, then Miller & Carter is worth a visit. I was very pleasantly surprised. I was invited to review Miller & Carter as a guest and as such all our food and one drink per person were complimentary. 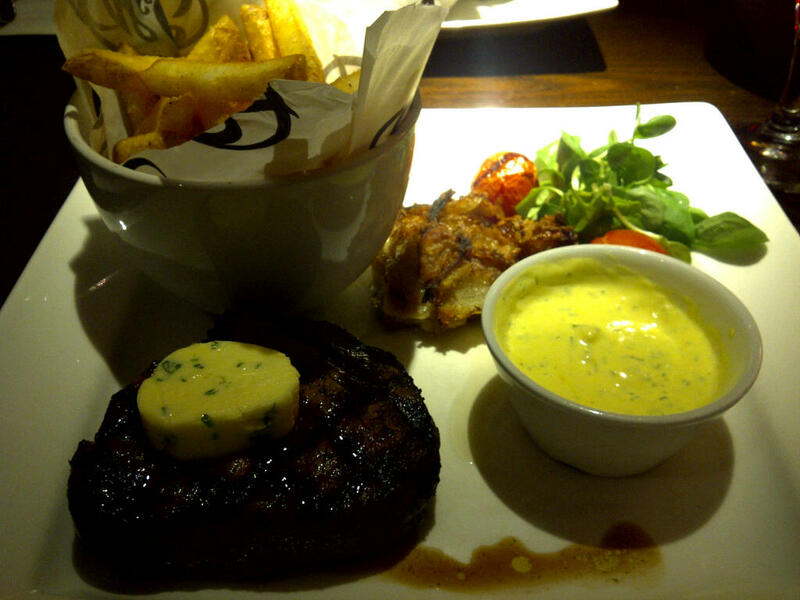 I eat with my wife and son at Miller and Carter, nr uci complex Cardiff Bay area, we spent a lot of money including booze, the food was great and I had one of the best steaks I have ever eaten out, I am a good judge I have eaten in many restaurants in the Uk and abroad on business and holiday and am considered a very good cook by friends and family.We will be trying there new one soon in Cardiff city centre.